← The Other Steve Jackson’s Sorcery! 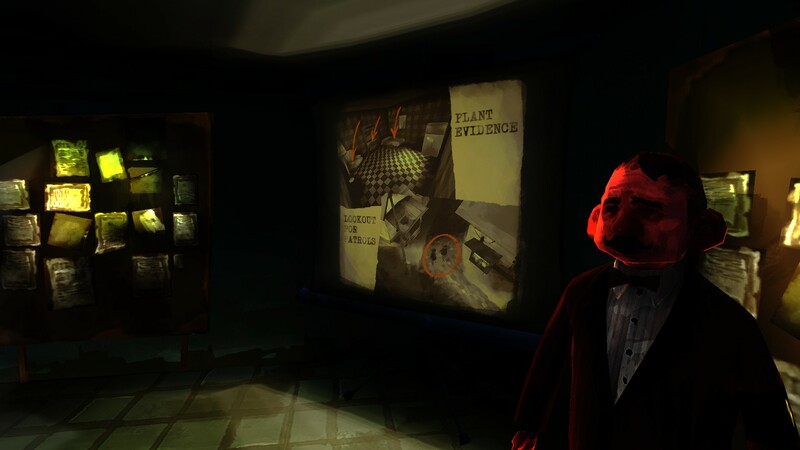 The very first visual, presented by the opening menu screen of all things, sets the tone: a gray-haired man with a tightly-cropped mustache, a hook in place of his left hand, and features pinched from decades of scrutinizing the microscopic fonts of official documents, reclines uncomfortably upon a worn mattress in a room decorated with nothing but a typewriter, an assortment of communications equipment, and informative notices. This is your avatar in the smoky, detached world of Signal Ops: a mid-level government thug of sufficient rank to order around lesser thugs (those fit for field duty, which you definitely are not), but not important enough to know the location of the base his superiors have stashed him in. This is, I believe, Signal Ops’ first metaphor: that the innermost circle of government intelligence may be something like a fraternity, but it isn’t so concerned with brotherhood that its members won’t peek into each other’s journals as often as possible. For those who consume and breathe distrust and suspicion, it’s no surprise that there might be a camera mounted in the corner of one’s bedroom. The rest of us might be mortified at such blatant intrusiveness, but these are the sorts of men who aren’t quite able to grasp why. The second metaphor has to do with the game’s perspective. I mentioned above that other than the menu screen’s omniscient angles, the rest of the game is played out through the eyes of your hook-handed protagonist, a trick Signal Ops handles by showing the perspective of all your little soldiers on a screen — and not your screen, but the split-screens of the bunker that show you what your agents see, all at once. You are, in effect, a man commanding a man commanding a handful of men. One wonders, then, who is controlling you? But that’s the first metaphor talking again. Three agents go about their business. Once the tutorial is out of the way, having filled your head with a pile of information on how to switch between the abilities of multiple agents, you’re given your first mission. The briefing is deliciously sinister: your task is to plant evidence in the rooms of suspects so that they can be arrested by the regular police. You’re permitted three agents: a Bolt, who takes care of the transponder that keeps all your soldiers’ cameras transmitting and their earpieces receiving orders; a Wrench, who can open locked doors; and a Spy, who has the good sense to dress in regular clothes so he can distract the many patrolling policemen without raising their suspicions. With these three goons, you’ll sneak across town, avoiding patrols and secreting folders and banned books into the houses of unsuspecting civilians. Your nefariousness of your order is mildly dulled by the detail that they can’t merely order the police to look the other way, but gameplay must arise somewhere. Back to that second metaphor. I believe it has to do with the game of telephone that’s inevitably played as orders are relayed and the clarity of the message becomes ever more muddled. One wonders whether your agents have any thoughts or qualms with their questionable work, just as one wonders whether your own superiors have a broader view of the job they’ve assigned you. Whatever greater purpose your actions might be striking at has been lost somewhere along the wire. The man who delivers your briefing seems quite jovial about the prospect of rounding up folks for interrogation based on conjured evidence — dark humor, or twisted amusement? It’s hard to tell. And what are your own thoughts as you continue to explore the bunker between missions, finding misplaced briefs that round out the misdeeds of your ill-lit fraternity? Either way, at this moment, Signal Ops stands poised to deliver one hell of an interesting game. The setup has been brilliant so far, and it’s been more thought-provoking in fifteen minutes than most games manage across hours. Which is tragic, because then it falls on its face. Whatever their purpose, they certainly weren’t helping out YOUR mission. The tutorial sows the seeds of doubt as poor pathfinding, broken AI, and tedious gameplay rear their ugly heads. In the moment, taking in the richly layered dank of the bunker and the thrill of the task before you, it’s easy to think that maybe the tutorials were added later, tacked-on. Unfortunately, the main missions are even worse offenders. That Bolt agent, the guy who transmits the signal that relays the agents’ visuals and your orders, is perpetually carrying around a transmitter the size of a recliner, and the instant your men travel outside of a radius around him, their signal degrades to static. Worse, for this sofa-backpack to have any sort of worthwhile distance to its broadcast range, it has to be plugged in. Which means two things: for one, your Bolt agent spends about 90% of his time standing at an electrical outlet. Sure, you can have him unpack the receiver and leave it there while he goes and does something useful, but you’ve already got the all-purpose Wrench agent taking care of the general stuff, and you’re going to have to tend to that signal anyway, so you might as well leave him be. Which brings us to our second point, that when it’s time for your men to advance, you’ve got to rush your Bolt forward to the next outlet like a relay runner, trying your best to weave him through clipping doorways and outside the indeterminate sight radius of patrolmen. This is never once fun, let alone doing it a dozen times in the first level just to keep your agents from standing around like dazed cows. Needing to constantly keep everyone huddled around your Bolt agent ruins the game on its own, but there are plenty of other problems just as determined to take first place in the Ruin Signal Ops Contest. The AI is horrible, and it’s painfully noticeable when it comes to your agents, especially in the early levels where they’re equipped so poorly that it’s silly to think they work for a shadowy grocer, let alone a clandestine government organization. They drop like flies at the first sign of trouble, and the fact that an agent’s death can be remedied by calling for another agent from off-map rather than having to reload the game doesn’t do much to remedy it. A light jog causes enough noise that policemen will abandon their patrol to investigate, raising the question of how anyone in this country gets around, and traveling across the map in a sneak-crouch is so cumbersome that your men might as well be moving via slow-motion duck walk. Through molasses. Even the lowliest civilian won’t leave you alone, running off to alert the nearest cop at first sight of anyone but your Spy. Even if you do manage to get a drop on your enemies, and even if by some good fortune you win the fight with the police and the wonky controls, more will arrive from spawn points to further annoy you. Not that you’ll survive, since your enemies will see you before you see them, because the screens are so damnably tiny that it’s nearly impossible to make out what’s going on even with a large monitor. 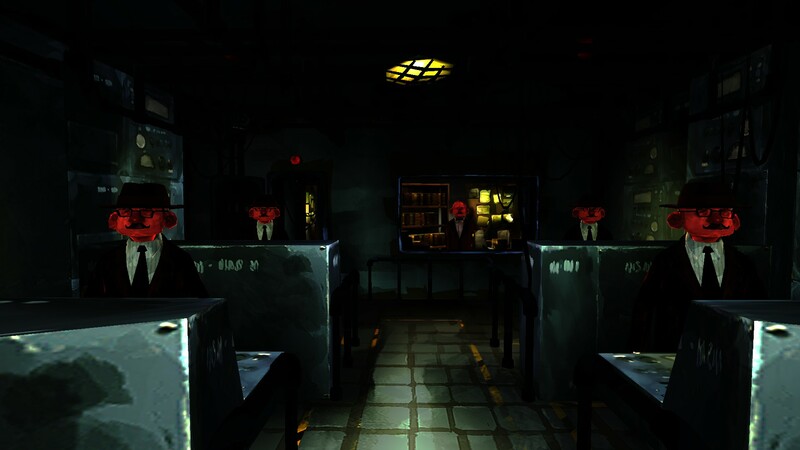 The game’s murky visuals, while distinct and interesting and good at concealing the game’s indie budget, compound the problem. Keeping track of just three agents can be a chore, and it only gets worse as you pick up more in later missions. All of these things add up to one big fat cardinal sin of gaming: it’s tedious. Everything, from moving to shooting to sneaking to using your agents’ abilities, feels like a job. There are only nine missions, but they drag on — even on the first, you’ll be planting evidence in eight houses when three would have sufficed to get the point across. 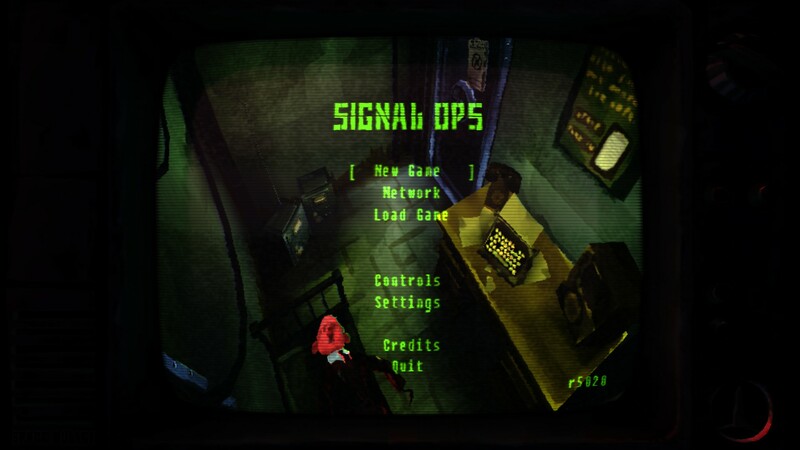 As much as I enjoy writing negative reviews, I’m not happy to say I didn’t like Signal Ops. It has the strongest opening I’ve seen in an indie game this year, and its theme was enough to push me through most of the game even though I wasn’t really enjoying myself. The thick intrigue, the mysteriousness of my own agency, and the ill deeds it saw me perpetrating, were all fascinating. But in the end, there wasn’t a good enough game at the heart of Signal Ops to keep me interested. I began with a comparison to Atom Zombie Smasher, so I’ll end with that as well. I’ve seen some reviews claim that this is just like that magical brand of older games that were bold enough to not bother with patronizing hand-holding, but that it instead throws you into the deep end and lets you figure out its puzzles for yourself. That assessment doesn’t strike me as accurate. It’s one thing to provide a challenge; it’s another entirely for that challenge to be that your game is boring and glitchy. The challenge should be in the beating of a level, not in wrestling with the controls, fighting off boredom, or micromanaging repetitive actions. Atom Zombie Smasher was, in addition to being chilling and meaningful, a smooth little game that never outstayed its welcome. Unfortunately, Signal Ops does precisely that. So as much as I’d like to fool myself into believing it’s a flawed nugget, I’m sad to say this one is pyrite. Posted on June 25, 2013, in Reviews and tagged Indie, Signal Ops, Space Bullet Dynamics Corporation. Bookmark the permalink. 3 Comments. Well, that’s too bad. I was hoping this one would be good. 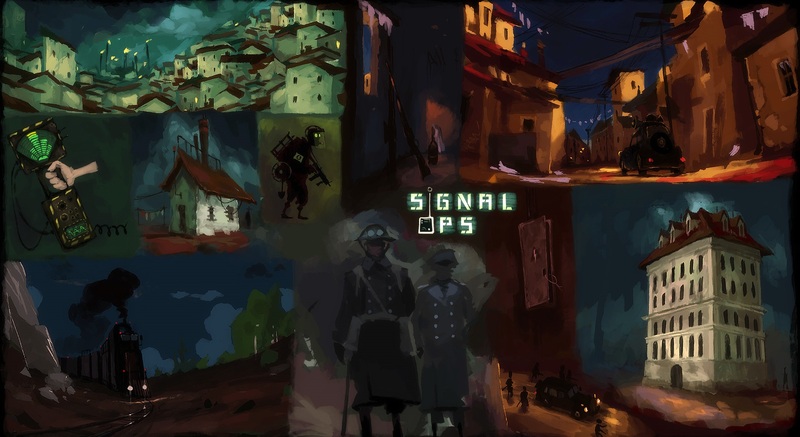 Thanks (from one of the developers) for taking the time to play and write about Signal Ops! Just wanted to let readers know that we have done numerous patches to address some of the issues described. 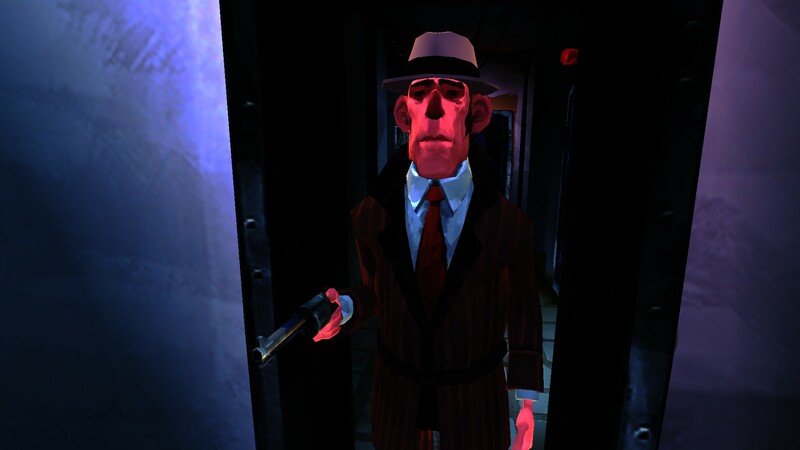 For example the original release had some bugs with pathfinding and agents getting stuck, which are now fixed. We understand that what for one person might be a welcome extra layer of challenge could be tedious for others. To remedy this, we’ve added difficulty modes in the latest patch. These are not difficulty modes like most games that make enemies hurt you more, but actually changes the gameplay mechanics surrounding the radio. You can opt to have a permanent radio signal in the areas of the level you have already visited, or even do away with the need to plug in the radio completely. It is good to see that the atmosphere we were going for came through. The new patch does help, especially if you play with easy or normal difficulty to alleviate the tedium of having your team sticking to your radar-man so closely, but it still has problems. For one, there’s still a lot of clipping, getting stuck on the environment, NPCs having trouble rounding corners, etc. And for another, the game is just BORING for the most part. 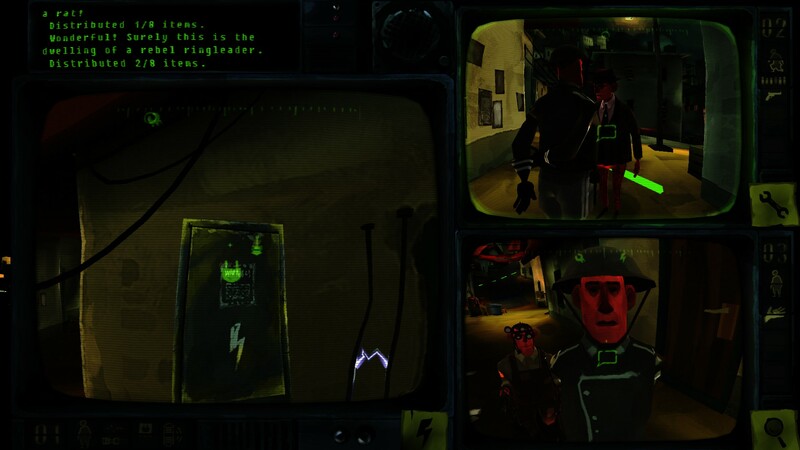 The second mission, for example, is like eight circuitous fetch-quests, with a tedious guesswork puzzle thrown in for good measure, while enemies hunt for you. There are some fun levels, like the sniper one, but for the most part it’s just really really dull. Though getting rid of the radar mechanic by playing on easy does make it tolerable.